Metal inert gas or MIG welding has been around since the time of second world war. Initially it was considered to be a small-diameter, high-current-density and bare-metal electrode process which made use of inert gases for arc shielding. This semi-automatic process has gained widespread usage presently in the creation of durable and strong joints by heating them using an electric arc which is set between the workpiece and a consumable electrode. A gas mixture or supplied gas acts as a shield to the molten weld pool and the arc. Considered by all as one of the easiest welding types for developing an expertise, MIG welding serves both professionals and novices alike. It operates by feeding a wire to the gun from the machine. You just need to point it at the spot you wish to weld and pull the button. All commercially important metals like that of high-strength low-alloy steel, aluminium, nickel alloys, copper can be welded by selecting the right parameters of electrodes and shielding gases. Easy to learn process perfect for rookie welders. Usage of shielding gas leads to minimal contamination of outside elements such as hydrogen, oxygen or nitrogen which are known to trigger a variety of problems such as excessive spatter and holes within the bead. There remains no slag for cleaning up thus bringing mammoth time savings which can rather be spent on mastering the welding process. Weld pool visibility becomes maximum through the MIG mode. You are bound to get a clean and solid weld time and again coupled with its increased control and simplicity. Continuous wire feed paves the way for faster welding as you don’t have to alter rods constantly or brush away slag thus increasing your overall productivity. Can be used to weld an array of metals such as copper, aluminium, magnesium, iron, nickel, mild steel and stainless steel. If properly set, it can also weld thinner metals. Provides higher electrode efficiency ranging between 93-97%. Unlike flux-cored wires and stick electrodes, it does not pick up moisture thus depositing the welds consistently with low hydrogen levels. 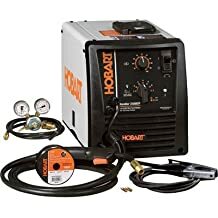 Carrying the brand name of the legendary Hobart, this MIG welder can be utilised by both experts and novices with equal ease as it combines best in class durability and performance in a single package. Paired with output power ranging between 25 and 210 amps, the Hobart device can be of great helping in welding various types of material ranging from aluminium to steel. It reaches maximum duty cycle of 30% at 150 amps thus making it possible to weld at an enhanced speed without having to compromise on the product quality. With an ability to weld through 3/8th inch thick mild steel, this machine can be utilised for auto body repairs, home repair and even light industrial tasks. But it might become difficult to move around the Hobart welder given its bulky 80 pounds’ shape. In such cases, you can opt for a cart to carry it around easily. Paired with the dual voltage input of either 115V or 230V, the Hobart Handler secures its stronghold as the reigning champion of versatility. You can alter between the same by a simple twist of the wrist without the requirement of any tool. Its dual groove drive rolls and aluminium drive system aids in easily switching between various wire sizes. Variable voltage control producing minimal splatter. Production of clean and high quality weld time and again. Perfect for beginners given the minimal operator skill requirement. Dual voltage input capability aids in using the device both in industrial welding sites and at home. Convenient access to polarity changeover. Self-resetting of motor protection and thermal overload. The on-off switch might seem to be a bit ragged. Not meant for heavy-duty fabrication. The 2017 model of the Everlast PowerMIG blows away the hassles of traditional gas wielding coupled with its fully automatic control courtesy the IGBT inverter mechanism. Thus, the unit won’t have to be rewired for switching between the voltages time and again. Both the Stick and MIG mode guarantee powerful performance with minimal splatter while you carry around this 240-volt welding machine weighing less than 35 pounds in an easy manner. This is the type of welding machine which can be utilised for field-based welding jobs as it unleashes a maximum power of 200 amps. Its duty cycle of 35% is pretty decent and users can make precise adjustments by seeking help of the dual digital displays. The current rise time in MIG mode is controlled by the arc force which also affects the device’s puddle fluidity and bead contour. It also comes with an auto pre and post flow control feature which augments the weld quality during stops. The Eurostyle coupling of the unit allows the usage of aftermarket guns for ushering in cost savings as you don’t have to buy the branded ones coming with a hefty price tag. Dual power system perfect for being run on either 110 or 220 volts. Less splatter production when compared to peers. Easy alteration between Stick and MIT modes whenever required. Analog knobs make it difficult to adjust the setting especially when you are in the middle of something. The wire-speed system cannot be controlled marginally. This dynamic welder can suffice both seasoned pros and beginners with equal ease while they take up an array of household welding projects. With a duty cycle of 20% at 90 amps, this MIG welder can easily take on aluminium, steel, stainless steel and much more having a maximum thickness of 1/4th inch. This can be the perfect plug-and-play device for farm equipment repair, maintenance welding and auto body work. It can even take on some heavy-duty projects in spite of not being a 220V machine. Running on 115 volts of input power, the Hobart Handler can be used anywhere in the house. It also comes with a bevy of special features such as the five-position voltage control selector which allows users in tuning their arc and a built-in contractor which keeps the wire “cold” until the trigger of the spool gun is pulled. The unit is also braced with short circuit protection and thermal overload system which guarantees us with complete peace of mind while welding thin materials such as stainless steel and aluminium. In spite of being a bit on the bulkier side courtesy its 60 pounds built, the 10 feet MIG gun, convenient handle, 10 feet power cord make it quite portable. Convenient wire changes through the quick-release drive roll system. Customizable arc through 5-position tapped voltage selector and 115-volt household current. Auto resetting thermal overload protection for preventing accidents triggered by overheating. Convenient access to tools through the built-in storage. Not suitable for welders working off-grid since it cannot function on a generator. Lack of any safety gear making it imperative for making specific purchases. 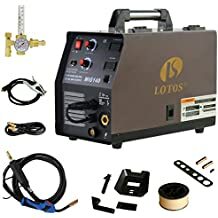 It is now possible to create industrial quality welds without having to spend a fortune coupled with the Lotos MIG 140 welder which has already become a hot favorite of DIY-ers taking up simple repair projects around the house. The stellar attributes of this welder pose it as the ultimate choice for being used at any professional shop where you take on projects requiring extra precision given its dual digital displayers which provide exact settings by adjusting the voltage and wire feeder speed for producing strong welds. The multi-use machine can be used for welding mild steel, stainless steel and even aluminium on separately purchasing a spool gun. Be it professional fabrication jobs or decorative metal work, this versatile machine can help you in performing all the activities seamlessly. Pesky wire tangles are prevented by digital wire speed display wherein you can exercise complete control over the voltage and speed coupled with its 2T/4T switch and dual displayers. 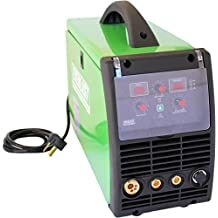 This machine can be set up easily within just 10 minutes by connecting it with a 110V wall outlet for starting with its welding operation. The added thermal overload protection system assists in welding for long with minimal safety concerns. The Lotos 140 is accompanied with a ground clamp cable, MIG torch, gas hose, argon regulator, welding mask, wire and many more. Accompanied with a 30-day warrantee to keep you covered against device faults. Comes with an array of accessories for getting you started right away. Spool gun has to be purchased separately if you wish to weld aluminium. If you wish to benefit from the supreme flexibility of gas shield MIG welding and flux core, then the Lincoln Electric 208/230VAC can surely serve you well. 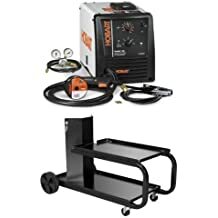 Tailor made for beginners to learn the art of welding, this powerhouse can weld through every type of material imaginable. The machine wire runs smoothly with no crimping or tangling and paves the way for optimum arc as desired. It has always been cumbersome to get the wire up to the welder since drive wheels have a tendency of slipping. 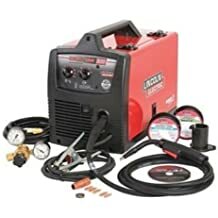 However, this precision cast MIG welder is machined specifically to steer clear of such problem scenarios. Paired with 180 amps of power, you can easily weld stainless steel and aluminium. The compact sized MIG welder with a 50-500 wire feed speed control can provide you with adequate regulation over the same. Whether you are working on an auto body or at the farm, this versatile welder using a variety of wire thickness can engage in fabrication as well as repair and maintenance almost everywhere. The Lincoln MIG welder comes stacked with advanced solid-state circuitry having waterproofed and shielded circuit cards which controls all of its actions. This Handheld welder can easily outcast its competition coupled with adequate armour against impact and shock damage. Packs in immense power for a compact welder. Good quality parts made of plastic and metal components. Brass to brass connectivity for the gun improves conduction. Material dynamics can be altered by simply varying the wire thickness. Erratic wire speed reported by certain users. Less portability due to heavy structure. You are bound to be flooded with options while searching for a welder which belongs to be below $1000 price category. But if you know exactly what to look for, then the search process will become much easier. Whether you are an amateur DIY welder or a professional running on a strict budget your main aim should be in bringing home an MIG welder which provides you with optimum functionality at a reduced cost. The excellent models readily available at the market come packed with bombastic features such as adjustable drive systems which avoid wire tangling and bring about extra precision while switching between flux cored and MIG welding process.